Specialising in heavy industrial load & walkable ceiling system, prefabricated for quick installation, easy demountable and a 5-year guaranteed non-maintenance wall partition system. Our range of products include ceiling grid systems, machine enclosures, teardrop lighting fixtures and industrial products such as metal framing systems (steel channels). We are also the sole Malaysian agent for Hae Kwang Co. Ltd. - a world leading manufacturer of aluminium raised floor systems used in high-end cleanrooms and data centres. Our production process and products are certified in accordance to ISO9001:2008 system certification, Malaysian Fire and Rescue Department “BOMBA” and SIRIM QAS and TUV/PSB Corporation : BS476 : Part 6 & Part 7 standards certification. We also specialise in producing GMP Compliant Flush Ceiling & Partition System. 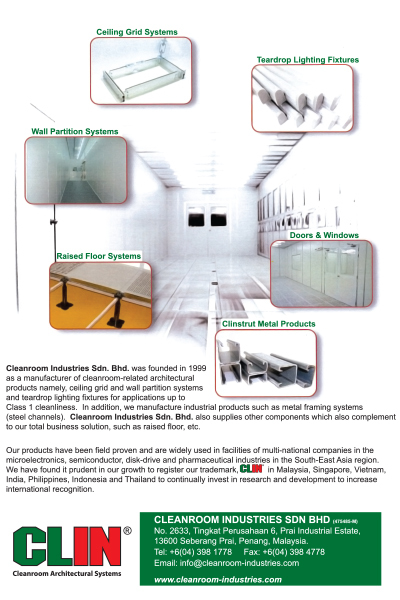 Today, we have been successful in gaining recognition from the local market and from ASEAN countries with our superior yet affordable high-end cleanroom building materials.